THE roots of Helensburgh’s now closed St Columba Church sprang from a group of Dissenters who met fortnightly in the Baths Hotel for Sunday worship, often with a visiting minister. The hotel was owned by a prominent member of the group, Mrs Margaret Bell, widow of Henry Bell, first Provost of Helensburgh and pioneer of steam navigation. On other Sundays the group travelled to Dumbarton. When their number grew to 58 they moved to the old Theatre in the Municipal Buildings at the junction of East Princes Street and Sinclair Street, which also served as the Town Hall and Courthouse). It was there on November 23 1843, that they decided to petition to become a church, and the United Associate Presbytery of Glasgow granted this on March 27 1844. Five Elders were chosen on June 5 1844 and they were able for the first time to celebrate ‘The Holy Ordinance of the Communion Supper’. Wasting no time, as usual, eight days later they decided to build their own church. The architects, Messrs. Brown and Carrick of Glasgow were employed, and the foundation stone was laid on March 11 1845. Three months later the Relief and Secession Church opened with the Rev Dr Alexander MacEwen as their first minister. 1847 saw the union of the Relief and Secession churches, and consequently the church became the Helensburgh United Presbyterian Church. By 1860 the congregation had outgrown the ‘Wee Kirk’, in spite of a gallery being built in 1851. So, never slow to respond to the needs of the moment, they decided to build a new church. William Spence, the architect who had built Rhu Church, was chosen, and the new church in Sinclair Street was opened in 1861. Ever forward-looking, great changes were incorporated. These included communion cards instead of tokens, ‘a bell of deep tone’ to suit the lofty tower, a Sylvester stove for comfort, and a beautiful stained glass window to grace the west wall. Four respectable ladies were employed for £2 per annum to clean the church and open the pew doors for the worshippers on Sunday. The next heart-searching concerned the introduction of music to replace the precentor — who traditionally led the singing — with an organ in 1879, hymn books arrived in 1880, then in 1881 a 2-manual organ was installed, the second Lewis organ to be installed in Scotland. The fact that an organ loft had entailed the partial demolition of the west gable had not deterred these stalwarts from ensuring that the Word would be heard in all mediums. In 1887 the Women’s Guild was formed. Later years saw the Young Women’ Group and the Link Group evolve, also the Men’s Guild and the Golf Club. In 1900 the Free Churches and the United Presbyterian Churches united to become the United Free Church. In 1901 the new Constitution was instigated, but the ‘voluntary principle’ was preserved. A new name was necessary for the church. ‘The Central Church’ was suggested, but the minister, the Rev Adam Walsh, argued that it sounded too like a station. He persuaded the Session to agree to his choice, St Columba Church. In 1929 the United Free Churches and the Church of Scotland joined forces. St Columba has nurtured the young in Sunday School, Columbians, Boys’ Brigade, Brownies, Girls’ Brigade, to mention a few. There were Sunday School Picnics, Youth Club, Cafe Club, in an effort to interest them in the Christian life. 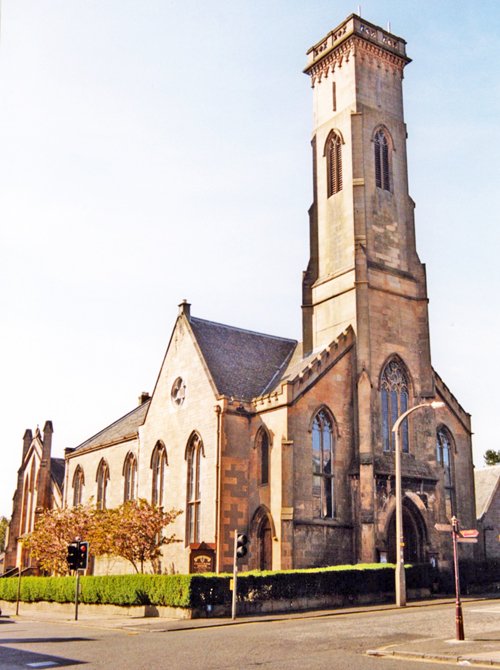 The church always endeavoured to keep the standards handed down from the past, until its merger with the West Kirk and the introduction in 2015 of Helensburgh Parish Church. The building has now become the Tower Digital Arts Centre, and a submarine museum is planned for the main church hall.